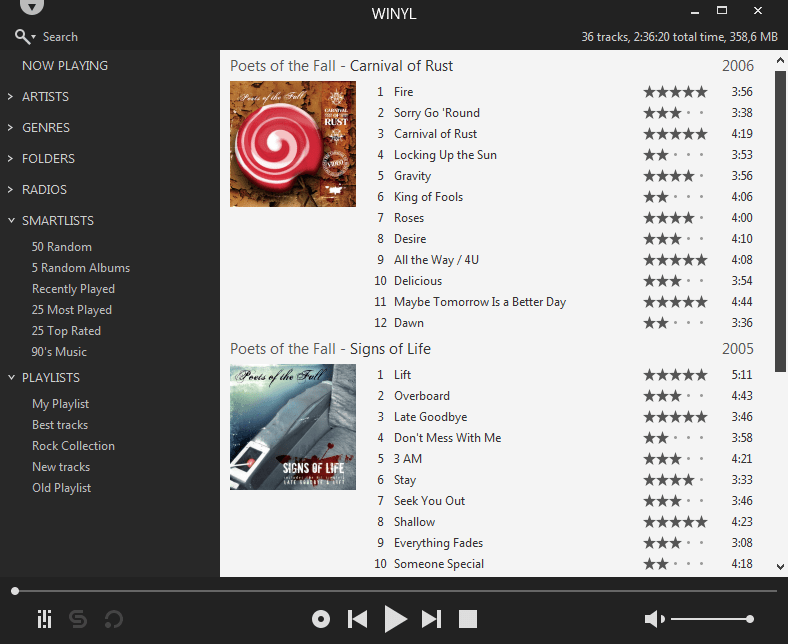 Winyl is a lightweight digital audio player with a minimalist design and skinable interface. The program plays all popular formats and automatically organizes files into categories based on audio tags, making your music easy to find and play. The program offers music organization tools, Internet radio, track rating, smart playlists, rapid search, song lyrics and music tagging. How to extract: Download the 'portable' ZIP package and extract to a folder of your choice. Launch Winyl.exe. Optionally, delete unnecessary language folders. The custom icon name to Main.ico instead of Winyl.ico. 64 bit "test" version available: http://vinylsoft.com/download/winyl_portable_x64_test.zip I have not had any problems with it. Yes! I am glad I did a small contribution to the development of Winyl by testing it with some Cue sheets. The developer is a very helpful guy and he fixed all the problems some Cue sheets caused. Winyl is nice, what I miss (as usual) is support for Cue sheets, as far as I remember the developer once promised to implement it in the future but this future hasn't come yet. midas - Doesn't work without the initial library scan. Interface is very neat and clean. I would switch to this as my favorite directory player (currently 1by1) if they removed the indexing and if they allowed us to customize the radio section.